When Mark won $50,000 in the Pepsi Refresh grant program at SXSW last year, he used it to create a new project called We Are Visible, which empowers homeless people to connect with others via social media. He also just returned from a road trip across the U.S. to raise awareness of homelessness and to share the stories of the homeless people he met in each city. Throughout all of this, Mark has been on the verge of homelessness himself. 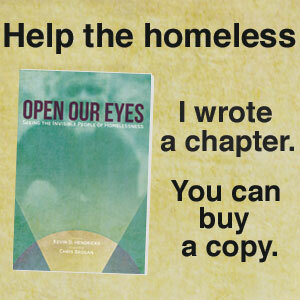 Kevin wanted to find a way to help support Mark in his important work and came up with the idea of creating a book that has just been released — Open Our Eyes: Seeing the Invisible People of Homelessness — as a joint fundraising/awareness-building project. When you purchase a copy of this book, 100% of the profits will go directly to Mark and InvisiblePeople.tv. The book includes the stories Mark has chronicled on the InvisiblePeople.tv site, along with short essays from people whose lives Mark has touched and ideas for how readers can make a difference for people who are homeless. Below is my contribution to the book, but please buy the book to read the rest of it as well. Other contributors include: Brad Abare, Chris Brogan, Wendy Cohen, Lee Fox, Jessica Gottlieb, Alan Graham, David Henderson, Jeff Holden, Michael Ian, Becky Kanis, Natalie Profant Komuro, Jeff Lilley, Geoff Livingston, Heather Meeker, Brandon Mendelson, Stefanie Michaels, Scott Monty, Shannon Moriarty, Chloe Noble, Stephanie Rudat, Kari Saratovsky, Lisa Truong, and Scott Williams. Mark Horvath is my hero. Not just because he selflessly devotes himself to raising awareness of the issue of homelessness, something that most people prefer not to contemplate, but because of how he is doing it. Mark does not just make noise, screaming “Someone has to do something about this problem!” He grabs a bag of socks and heads out to tell the stories of homeless people, one by one. And he pulls the rest of us along at the same time. The Invisible People project is truly a poster child for what can be done in the social media era. When people complain to me that their budget is too small to make a difference, I point them to what Mark has been able to accomplish with a budget of—essentially—zero. Though I’m sure he would prefer to have a fancy video production and editing set-up, the constraints of his equipment have actually worked in favor of what he is trying to accomplish. The raw, unedited footage parallels the raw emotions that the stories often evoke in viewers. By giving homeless people a voice, Mark is helping the people most affected by the problem to be part of the solution. When he gives them the opportunity to tell their stories, he reminds us that they are human beings first, above all. We can no longer pretend that the shabby figure with the shopping cart does not experience the same emotions as we do, or that they prefer to live on the street. And Mark has opened our eyes to the fact that beautiful children and babies are homeless too. If all the project did was just to make us “see” the homeless people we pass every day, that would be a major accomplishment. But the larger picture is that Mark sets an example that inspires others to take action. Mark is one of the biggest mensches that I know. The Yiddish word mensch doesn’t just mean a good person, but someone who does the right thing no matter how inconvenient or difficult. Despite the fact that he is constantly on the verge of becoming homeless himself, as soon as he finds out that someone needs assistance, he does whatever he must to help that person. The biggest payoff of the Invisible People project is that it pushes us to get out of our comfort zone and follow Mark’s example. People are hurting everywhere, so much so that the problem seems overwhelming. But he shows us that each of us—one person at a time, just like Mark— can use our unique talents to help one person at a time. All proceeds from this book support the work of Mark’s nonprofit InvisiblePeople.tv. You can also support InvisiblePeople.tv directly by making a donation. Buy it from Amazon for $9.99. Buy it for the Kindle for $3.99. Other digital versions are also available. Better yet, if your organization could use someone who is an expert at using social media to make people care about an issue, offer him a job. How have his talents and passion not been snapped up by a smart advocacy organization yet? China’s Olympic Rings or Olympic Handcuffs? Nedra helps nonprofits and public agencies create positive change on health and social issues through social marketing and transmedia storytelling strategies at Weinreich Communications since founding the company in 1995. She helps organizations make a difference for the populations they serve by strategically designing programs that draw on state-of-the-art behavior change techniques, digital media approaches and the power of stories. Join our email list for social marketing news and training opportunities. Facts vs. Emotions – Who Wins? 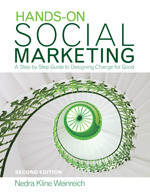 Free eBook to Celebrate 20 Years in Social Marketing! An Open Letter to the New "Social Marketers"